WAXIE works with you to create a positive first impression, increase satisfaction ratings and referrals, and build brand loyalty by helping you to provide your visitors with a cleaner, healthier, greener and safer guest experience. We have been working with hospitality facilities like yours since 1945, and our experienced and knowledgeable consultants and specialists have been trained to solve your most challenging facility maintenance needs. 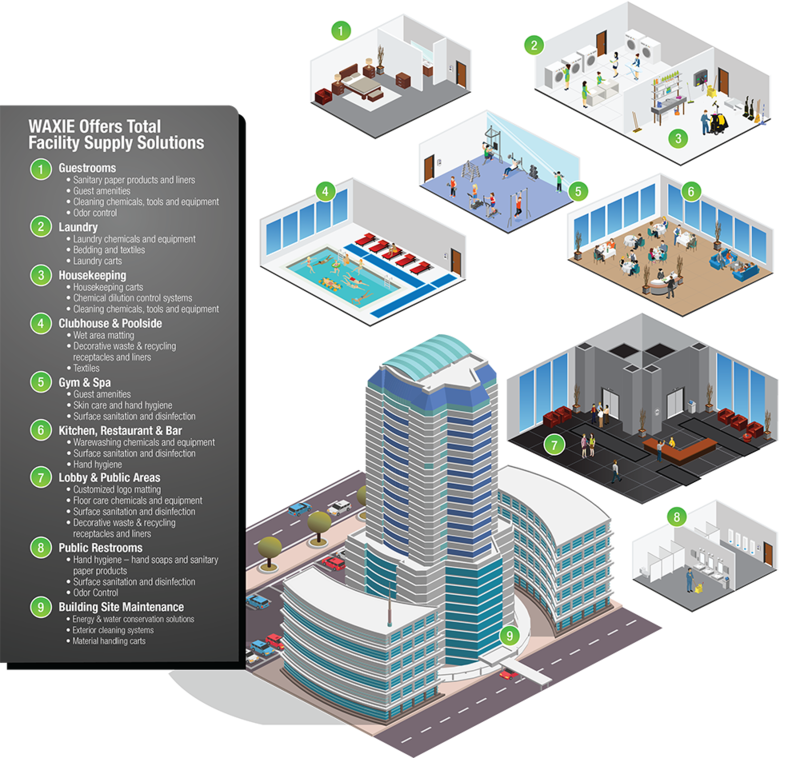 And our market-specific but broad product solution offering and extensive customized training support for hospitality facilities illustrate how WAXIE is a company which has been purpose-built to serve those who are responsible for keeping our community hospitality and lodging facilities clean and healthy. Results WAXIE works with you to deliver a custom-fit cleaning solution which will help you maintain a clean, fresh and hospitable property for your guests. WAXIE delivers a combination of cost-effective and innovative cleaning solutions combined with the education and training your staff can use to achieve high quality results. And WAXIE’s courteous and quick bilingual ongoing customer service support can serve as a complement to your efforts to achieving high guest loyalty ratings. WAXIE is set up to work with busy Hospitality & Lodging Professionals – and we realize that what we do is a small but important part of your overall responsibilities. Our online web@work e-commerce platform with incorporated budget management tools gives you control of, and visibility to, your overall facility supply spend, making it easier for you to manage. WAXIE’s e-commerce platform helps you identify all the “right products” at the “right price”. WAXIE works with you to help you reach your sustainability goals. WAXIE GPS® Green Partner Support™ is a collaboration and partnership between WAXIE and your hospitality and lodging property – and it is a comprehensive approach which addresses everything you will need to implement an effective green cleaning program which reduces impacts on both human health and the environment. 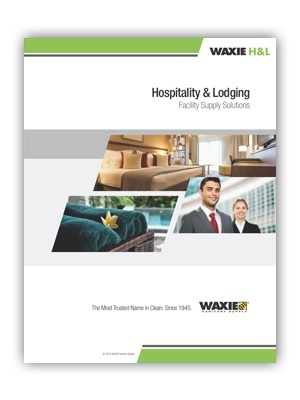 WAXIE has the experience and expertise to help guide you to hospitality and lodging facility maintenance solutions which will help you reach your overall sustainability goals and enhance your guest experience. Fill out this form to Download the WAXIE H&L Brochure. You will then be provided a link.